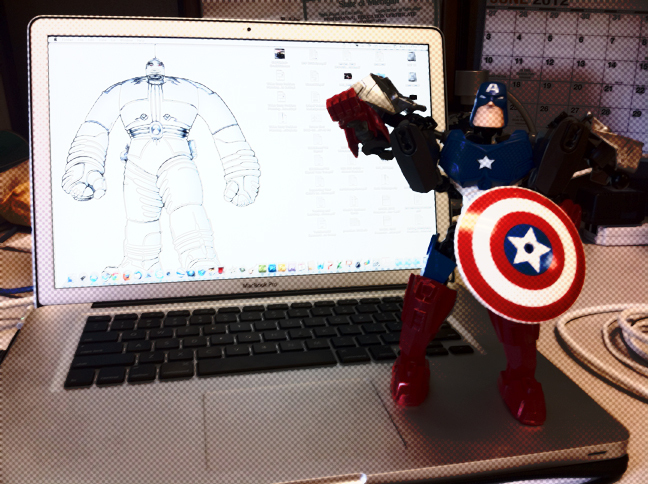 Of course, Captain America would choose the BGY-11 as his background. They're both as American as apple pie. What does Captain America do when not saving the world from crazed Nazi scientists? We know he served his country as a part of the U.S. armed forces, and is an integral member of The Avengers, pontificating on what is or isn’t righteous in a rather old-fashioned Americana way. Most recently he spent a few years thought to be dead, only to be reborn in mid-2009 when it was deemed that a character of his moral fiber was needed once again (translation, he had been dead long enough to capitalize commercially off of it). But what does Captain America do when he’s not busy stomping enemies of the USA and being six feet under? While I might have a Herculean task comparing what most public school teachers do for a living to Captain America’s exploits, the question I found myself pondering today was what do teachers, much like super heroes, do “behind the scenes” that the public doesn’t get to see? How do we unwind ourselves in such a difficult time (at least here in Michigan), where it seems as though all of our traditional foundational structures are shifting out from beneath us? Captain America and the rest of the Avengers can hang out in cool secret flying military bases for only so long before they must have to seek out something to stave off the boredom in between world-ending evil plots. As the summer looms large for many educators, some already on break, I wonder what my colleagues do in their “off time”. I know that some tend to small family farms, others do driver’s education (more teaching), and tutoring (ditto), but I’m always curious about the teachers that have jobs beyond what you might expect. I used to work at a small independent children’s bookstore in the summers, which actually complimented my growth as an elementary educators, but I do know a few that have tended-bar, played “dj” for the summer, and one recent discovery was a teacher who has taken a 2 year leave of absence to join the Peace Corps. Those are certainly “un-teacher” like in much the same way that Captain America typing away on a computer doing data analysis or input would seem rather “un-hero” like (even if it is just a tiny LEGO model of him). I don’t have the luxury of unwinding anymore; I work almost all year long (save for July) in my position as an instructional technologist. The summer is different, where I get to develop and work on curriculum and plan for the coming year, but it’s still in the same environment as the rest of the school year, and I miss that “down time” of being able to turn off teacher-me and do something completely else. Which is probably why I’ve been so enamored with ds106 this past year, and plan to spend a great deal of time this summer learning a lot of new tech tricks and tools thanks to creative assignments such as the “comic book effect” image above. I hope it can get me through the rather lonely weeks of late June and early August when the buildings are close to deserted and I have to force myself to stay on task, with only the clock as my closest reminder of any deadlines. For those curious about creating the comic effect above with Photoshop, I found a rather ridiculously easy tutorial on YouTube that you can watch below.